Polish English dictionary - English Polish Dictionary. Electronic Translator for Polish Language. Raising the bar on smartphones, the ECTACO English <-> Polish SpeechGuard TLX is the perfect tool for a world traveler, language learner, or someone who just needs a superior, rugged Smartphone. The entire system is based on years of research & modeled after the original SpeechGuard, which was used by US Armed Forces during the second Gulf War. With the ability to receive FREE incoming calls in over 160 countries with NO CONTRACT it's easy to stay in touch with friends and family when you travel. Loaded with everything you need for making sense of your world in a foreign land, the SpeechGuard comes with a voice translator, picture translation, travel information, voice recognition and a Language Teacher to name very select few. It's even been called the "Panasonic Toughbook" of the smartphone world! The Ectaco Partner LUX English <-> Polish Free Speech Translator features an unbeatable combination of the expansive and powerful Android operating system and Ectaco’s proven language learning and communication suite. At the forefront is the LUX’s incredible ability to translate free speech between English and Polish. The LUX also includes a full text translator for translating words, sentences, or phrases. Combined with the audio phrasebook with 14,000 phrases and a real native speaker voice, language barriers will cease to exist when travelling. For learning a language, the device is loaded with the Ectaco Language Teacher which has multiple levels of teaching capabilities. This includes a beginner to advanced progression from alphabet to words to phrases to dialogues. This program will recognize your voice and help correct your pronunciation as well. The LUX has many more fully fledged features including an English and Polish dictionary with over 6,000,000 words and phrases, as well as the UT183 translator with translation to and from 183 different languages. Additional features include lots of games, an eBook reader, a talking picture dictionary, grammar courses, preparation for many common language tests, and much more. Partnered with the Android operating system and the ability to be expanded with any apps, the possibilities for the Ectaco Partner LUX English <-> Polish are limitless! The Ectaco Partner LUX 8-Language Free Speech Translator features an unbeatable combination of the expansive and powerful Android operating system and Ectaco’s proven language learning and communication suite. At the forefront is the LUX’s incredible ability to translate free speech between 8 different languages, including English, Spanish, French, German, Italian, Polish, Portuguese, Russian. The LUX also includes a full text translator for translating words, sentences, or phrases. Combined with the audio phrasebook with 14,000 phrases and a real native speaker voice, language barriers will cease to exist when travelling. For learning a language, the device is loaded with the Ectaco Language Teacher which has multiple levels of teaching capabilities. This includes a beginner to advanced progression from alphabet to words to phrases to dialogues. This program will recognize your voice and help correct your pronunciation as well. The LUX has many more fully fledged features including a dictionary with over 6,000,000 words and phrases across all of its languages, as well as the UT183 translator with translation to and from 183 different languages. Additional features include lots of games, an eBook reader, a talking picture dictionary, grammar courses, preparation for many common language tests, and much more. Partnered with the Android operating system and the ability to be expanded with any apps, the possibilities for the Ectaco Partner LUX are limitless! 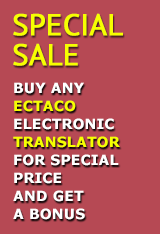 Build Your Own ECTACO multilingual translator! The multilingual iTRAVL Deluxe NTL-9C makes visiting or relocating to foreign destinations truly enjoyable. Travel once with iTRAVL and you’ll never leave home without it! iTRAVL Deluxe contains everything you need to start speaking another language fluently. The Language Teacher system takes you from beginner to advanced speaker in no time at all and makes speaking another language easier than ever before. It’s like having your own personal tutor! iTRAVL Deluxe provides real help when you are on vacation or moving to a new country. Detailed maps with destination advice and addresses help you find your way around in no time at all. The included iHELP resource gives you immediate access to a list of emergency or frequently used phrases. All you do is say a phrase and iTRAVL speaks the translation back instantly. Get fast translations of longer texts. Now you can translate just about anything and get a readable, understandable translation every time. iTRAVL Deluxe provides accurate 2-way Full-text Machine Translation between English and Chinese, French, German, Italian, Polish, Portuguese, Russian, Spanish! Speak into the iTRAVL Deluxe and have your phrases translated and spoken aloud instantly using a unique combination of Speech Recognition, real human voice narration and speech synthesis. The world’s most advanced Speech Recognition System understands and speaks any of the tens of thousands of pre-programmed words and phrases contained in iTRAVL. iTRAVL Deluxe offers an almost unlimited choice of language combinations available on SD cards (purchased separately). Each card contains the entire linguistic content for each language combination for immediate updates. Now extend the usability of your device simply by adding a new SD card! 5,195,000 entry Multilingual Translating Dictionary with voice synthesis translates words and phrases from English to Chinese, French, German, Italian, Polish, Portuguese, Russian Spanish and back! MP3 player, games, talking calculator, metric converter, and word time clock utilities. AC adapter, headphones, USB cable, case and bonus CD are included in the standard package. Click here to check out the latest video presentation of ECTACO iTRAVL NTL series. Enjoyable language learning games so you can learn while you play – anywhere! Lost? Never Again. Detailed maps with destination advice and addresses will help you find your way around in no time. Need a more hands on approach? Now asking for directions has never been easier. The combination of a fully translating Dictionary, PhraseBook and Travel Guide offers a compact and easy to use resource that fits in the palm of your hand. The inclusion of the CIA World Factbook, detailed information on every nation in the world is now just a click away. The Best of the Best! Easy to navigate and user-friendly iTRAVL offers a hi-resolution touch-screen interface that puts Windows CE powered convenience at your fingertips. A robust MP3 player lets you enjoy all your favorite media files and AudioBooks. Whether you’re on the go, or ready to study, this global travel companion is always at your side. With the inclusion of a convenient metric converter and a talking calculator, you can now verify exchange rates and have them pronounced instantly. In addition, a world clock is now accessible so you can check the time in any time zone just by clicking the location on a virtual map. The newest and best there is to offer, ITRAVL is like no other communication device in the world. Once you take a trip with iTRAVL, you’ll never leave home without it! Absolutely unique in the world of handheld language and travel assistants the multilingual iTRAVL NTL-19WLD includes everything the business or leisure traveler needs to make visiting foreign destinations an enjoyable and easily navigated experience. Unique multilingual handheld translates words and phrases from English to Arabic, Chinese, French, German, Hebrew, Indonesian, Italian, Japanese (kana), Korean, Persian (Farsi), Polish, Portuguese, Russian, Spanish, Tagalog, Thai, Turkish, Vietnamese and back! Reliable and accurate 2-way Full-text Machine Translation between English and Chinese, French, German, Italian, Polish, Portuguese, Russian, Spanish! Lost? Never Again. Detailed maps with destination advice and addresses will help you find your way around in no time. Need a more hands on approach? Now asking for directions has never been easier. The combination of a fully translating Dictionary, PhraseBook and Travel Guide offers a compact and easy to use resource that fits in the palm of your hand. The inclusion of the world-renowned Travel Guide lets you benefit from expert advice on hotels, restaurants, local attractions and transportation. Equipped with the CIA World Factbook, detailed information on every nation in the world is now just a click away. The ECTACO Partner C-4P is a fully expandable, professional-level Talking Dictionary. With two high-quality screens that open like a real book, it offers an enhanced translating and reading experience while taking up a fraction of the space. An absolutely exhaustive dictionary contains more than 1,000,000 words that includes the specialized professional vocabulary used by legal, medical and IT professionals. Equipped to speak any entry from its massive dictionaries or any word you type into it, the C-4P employs the latest TTS speech capabilities. It also comes pre-loaded with 14,000 indispensable phrases that can also be spoken out loud using crystal clear digital recordings of authentic native speakers. Packed with all the information and utilities necessary for complete understanding, the C-4P makes communicating in another language effortless and accurate. The new Partner is fully customizable and expandable and ready to keep pace with the demands of busy international professionals whether at home or abroad. As an additional benefit the C-4P package incorporates a bonus CD containing over 150 linguistic applications including translating Dictionaries, FlashCards and PhraseBooks for 39 languages that can easily be used to improve your command of the world's most popular languages. Expandable vocabulary: over 1,000,000 words pre-loaded in the general and specialized dictionaries with the option to add more than 50 language combinations available as ECTACO MMC/SD Cards! Unlimited pronunciation of text in both languages. Type any text you want and it will speak the word out loud using its built-in Text-To-Speech processor. ECTACO MMC/SD cards allow you to add a variety of languages and endless linguistic content from ECTACO, Inc.
FlashCards: the classic game that helps you to improve your vocabulary while you play! The world's first hands free/eye free 2-way communication system for use in investigation and situational procedures. Police work is dangerous enough without the added risk of language-based miscommunication. When tension levels are running high or even when interrogating a suspect there is often no time to wait for the arrival of interpreters. The ECTACO Law Enforcement SpeechGuard PD-5 provides instant backup for you and your partners in situations where communication barriers prevent you from carrying out your duties, saving lives, and bringing a situation under control. Designed specifically for use by Law Enforcement personnel, the Law Enforcement SpeechGuard PD-5 provides officers with access to thousands of directives, phrases, and questions that can all be issued without looking at the device. Recorded by professional native-speakers, all phrases are designed to be 100% understandable in extreme noise environments. Simply speak up to 3 words into the device in English and have a phrase spoken back in the language of the person you need to communicate with. Current languages include Spanish, Arabic, Russian, Chinese (Mandarin), Polish, Vietnamese, Korean, Japanese, and Farsi (Persian) with the possibility to add more languages upon special request. Select from thousands of situation specific phrases/questions and have them spoken out loud instantly in the language you have chosen using an easily understood human voice. Speak 2 or 3 keywords in high noise environments and have full phrases spoken on your behalf. All done hands free and eyes free! Complete two-way communication. Type a word or sentence in either of the pre-loaded languages and have it instantly translated into text and/or speech. Provides background information on the customs of the communities that you are engaged with. Learn to speak new languages phonetically with the aid of an audio/visual analyzer. Play MP3 files or record conversations for future reference. Please note: The ECTACO Law Enforcement SpeechGuard PD-5 has been developed specifically for use by the law enforcement community. A Test-to-Buy program allows you the opportunity to decide if the PD-5 is appropriate for your needs. Return units to us within 30 days of receipt and get a full refund with no questions asked. If you decide to keep the unit, let us know what additional languages and content (call for details) you require and we will customize the units to best suit your needs. The included Ectaco/C-Pen handheld scanner and iTRAVL desktop Cradle lets you grab text from wherever you find it - in a newspaper, a doctor's prescription or even from a poster on the wall. Simply scan it, upload it and get an instant translation into your chosen language! You can even use the scanner ti upload and translate on your home PC with the help of the included mini-USB to USB adapter and ECTACO software (sold separately). The ECTACO iTRAVL Deluxe package includes the iTRAVL handheld, the ECTACO/C-Pen Scanner, an SD card which contains the dedicated linguistic content of the device plus everything you need to get started including a rechargeable battery, a cradle for PC connection and charging, headphones, case, bonus CD, and the Ectaco/C-Pen connection. The ECTACO Partner C-4DP is a fully expandable, professional-level Talking Dictionary. With two high-quality screens that open like a real book, it offers an enhanced translating and reading experience while taking up a fraction of the space. An absolutely exhaustive dictionary contains more than 1,000,000 words that includes the specialized professional vocabulary used by legal, medical and IT professionals. Equipped to speak any entry from its massive dictionaries or any word you type into it, the C-4DP employs the latest TTS speech capabilities. It also comes pre-loaded with 14,000 indispensable phrases that can also be spoken out loud using crystal clear digital recordings of authentic native speakers. Packed with all the information and utilities necessary for complete understanding, the C-4DR makes communicating in another language effortless and accurate. The new Partner is fully customizable and expandable and ready to keep pace with the demands of busy international professionals whether at home or abroad. As an additional benefit the C-4DP package incorporates a bonus CD containing over 150 linguistic applications including translating Dictionaries, FlashCards and PhraseBooks for 39 languages that can easily be used to improve your command of the world's most popular languages. The ECTACO Partner C-4FP is a fully expandable, professional-level Talking Dictionary. With two high-quality screens that open like a real book, it offers an enhanced translating and reading experience while taking up a fraction of the space. An absolutely exhaustive dictionary contains more than 630,000 words. Equipped to speak any entry from its massive dictionaries or any word you type into it, the C-4FP employs the latest TTS speech capabilities. It also comes pre-loaded with 14,000 indispensable phrases that can also be spoken out loud using crystal clear digital recordings of authentic native speakers. Packed with all the information and utilities necessary for complete understanding, the C-4FR makes communicating in another language effortless and accurate. The new Partner is fully customizable and expandable and ready to keep pace with the demands of busy international professionals whether at home or abroad. As an additional benefit the C-4FP package incorporates a bonus CD containing over 150 linguistic applications including translating Dictionaries, FlashCards and PhraseBooks for 39 languages that can easily be used to improve your command of the world's most popular languages. Expandable vocabulary: over 630,000 words pre-loaded in the general and specialized dictionaries with the option to add more than 50 language combinations available as ECTACO MMC/SD Cards! The ECTACO Partner E15C800 Talking Electronic Dictionary and Travel Audio PhraseBook is a powerful multilingual travel companion. One of the most impressive language management handhelds available anywhere, it is the clear leader in the field of portable translation devices. With its sleek modern design, hi-res color touch-screen and state-of-the-art voice capabilities, it is our most advanced model. The extensive dictionary features a huge vocabulary with more than 10,000,000 entries. But the most impressive feature of this sophisticated handheld has to be the inclusion of some of the most advanced voice functions available anywhere. This one-of-a-kind device includes both sophisticated speaker independent speech recognition system that lets it understand what is said to it in Arabic, Chinese, Czech, English, French, German, Hebrew, Italian, Polish, Russian, Spanish, Ukrainian and crystal-clear, professionally narrated native-speaker voice output in Arabic, Bulgarian, Chinese, Czech, English, Farsi, French, German, Hebrew, Hungarian, Italian, Polish, Portuguese, Russian, Spanish, and Ukrainian. Providing frequent travelers and students alike with plenty of learning and communication options, this extraordinary device also includes cutting edge Arabic, Chinese, English, French, German, Hebrew, Italian, Polish, Portuguese Russian, and Spanish voice synthesis powered by the latest TTS (Text-to-Speech) technology in its collection of essential tools. Built to help users feel confident and relaxed when using a second language, it is intelligent, flexible and quick to respond. This latest-generation handheld is full to capacity with valuable information and indispensable utilities that help you to make the most of your foreign language skills whether traveling, studying or conducting business. Expandable vocabulary: over 10,000,000 words included in the general dictionary – one of our largest vocabularies ever! Any you can easily add more than 50 other language combinations that are available as ECTACO MMC Cards! Contains the classic Hangman language-learning game that lets users improve vocabulary while playing! The ECTACO EP850 is the newest generation talking handheld translation device from the remarkable Partner line. You have never seen anything like it before! Imagine a translator that not only helps facilitate communication with others and translates anything you want, but now teaches you the language too! It's like having your own personal private tutor; the Language Teacher section speaks to you using fluent native-language voice narration giving you step by step instructions, quizzes, and pronunciation help so you can start speaking correctly in no time at all! Combining words, pictures, and lessons, you talk into the translator and it tells you if you're pronouncing the words or phrases properly and then actually shows you how to say them, so you'll learn through speaking and listening at the same time. If that weren't enough, you have access to a complete dictionary filled with over 1,055,000 words you can look up instantly if your having trouble. And don't forget that there's a section of over 14,000 pre-recorded phrases spoken in fluent English and Polish. Opening a book and studying words for hours on end sometimes just won't cut it. But with a little help and a push in the right direction, learning an entire language can be accomplished in no time! The Language Teacher gradually builds up your vocabulary and pronunciation through lessons and quizzes you can take at your own pace. It even shows the percentage of how many lessons you have completed and how well you're doing! Need a fast translation you can't find anywhere else? Just type in a word and hit the translate button! From English to Polish or Polish to English, your translation will appear instantly. Then have it pronounced by the translator or you can try yourself! With 14,000 built in phrases, there's nothing you can't say! Just select a category, press the 'Say' button and the translator will recognize your phrase and give you a full translation which can then be pronounced fluently in that language. Advanced speech recognition modules understand what you say and let you test your pronunciation by comparing your speech with that of the device. If the Partner understands you then so to will everyone else. Unique combination of authentic native-speaker voice narration in the PhraseBook and state-of-the-art TTS (text-to-speech) voice synthesis in the Dictionary. Fully expandable vocabulary that includes over 1,055,000 words pre-loaded on the device in the general and specialized dictionaries - the most extensive vocabulary database ever assembled! More than 50 additional language combinations are also available as ECTACO MMC/SD Cards which can supplement the device! Audio PhraseBook designed with the frequent traveler in mind delivers authentic human voice output in both languages for over 14,000 pre-recorded phrases for commonly encountered situations. The included "You May Hear" section displays the different answers you might receive in response to your speech. Sophisticated Machine Translation system with unlimited pronunciation of translated text in both languages. Type any text you want and it will translate and speak the translation out loud using its built-in TTS (text-to-speech) processor. Interchangeable MMC/SD cards allow you to easily add languages and linguistic content from ECTACO, Inc.
Classic FlashCards language-learning game helps you improve your vocabulary while you play! Media Player with MP3 support to aid you in study and at play offers the ability to listen to the thousands of Audio Books that are available in MP3 format. The device comes pre-loaded with Rick Steve's Audio Tours. The C-Pen 20 English <-> Polish Handheld Translator and scanner is a remarkably affordable and reliable solution for handheld data entry and translation. A unique alternative to fixed desktop scanners, this exclusive pack includes the remarkable C-Pen 20 and the award-winning LingvoSoft Talking Dictionary and Talking Translator software - providing data capture and translation opportunities you never though possible! By letting you import the exact segment of text you need, C-Pen 20 saves time and energy and helps avoid the mistakes that come from manual data entry. And by instantly inserting your scanned data into the LingvoSoft Talking Dictionary for individual words and Talking Translator for longer texts including letters and technical documentation - it provides instant translation of any English or Polish text - no matter where you find it! With their state-of-the-art TTS speech synthesis, LingvoSoft applications even pronounce translations out loud using sophisticated text-to-speech modules. Now you can import information for translation from curved, laminated and patterned surfaces as well as from magazines, books and wall-posters by simply waving the C-Pen 20 over the desired text. Connecting easily with your laptop or desktop PC, it is lightweight and extremely portable offering instant translation from places you never thought possible. Use it in the library, at the office or even on a plane. Able to recognize printed text in over 167 languages it lets you send English and Polish words, phrases or paragraphs from books or documents to your PC for translation and pronunciation - helping you understand more and learn faster. C-Pen 20 English <-> Polish Handheld Translator and scanner includes the C-Pen 20 handheld scanner, LingvoSoft Talking Translator English <-> Polish for Windows and the LingvoSoft Talking Dictionary English <-> Polish for Windows for an unbeatable scanning and translation experience. Maximum portability makes using it at school, work, the library, or during voyages a breeze! Polish software is compatible with the following platforms: Palm OS, Windows Mobile, Windows, Windows Mobile Smartphone, Symbian OS, Android OS, Apple iOS. Among ECTACO software products for Polish you will find Software collections, Pocket Speech Recognition, Talking Partner® dictionaries, Travel Software, Bidirectional Dictionaries, Language Learning Software, Emulators of handheld dictionaries, Localization software, Additional software. Our Bidirectional Dictionaries offer extensive word bases and are easy-to-use study aids, perfect for those who are just starting to learn foreign languages. They feature instant word translation, back translation, intuitive word search, and phonetic spelling functions. Talking Partner® dictionaries provide bidirectional word translations and advanced speech synthesis. Translations are not only displayed as text, but are also pronounced, which makes these dictionaries a great audio aid for foreign languages learners. Pocket Speech Recognition software applications, once installed on your unit - can act as your interpreters in a great number of standard situations such as registering at a hotel, shopping, banking, etc. They hold phrase banks that contain a good selection of commonly used phrases for international travelers. Emulators of handheld dictionaries have all the functions of handheld electronic dictionaries with the exception of pronunciation and voice synthesis functions. Users can now familiarize themselves with the powerful linguistic features of electronic dictionaries. Localization Software is designed to make your Pocket PC do its work in your native language. Now your Pocket PC can communicate with your in the language you know best, making you feel at home, wherever you go. Software Collections are multilingual software packages attractively priced, holding an array of dictionary applications. Software for Language Learning: you learn as you play, with ECTACO Flash Cards. They bring you fun and exiting games where you easily learn new words and reach perfection in spelling. Traveling? Waiting for an appointment? Wherever you are, now you can work on expanding your vocabulary and build up the confidence you need in speaking and writing in a foreign language! Travel Software will turn your Pocket PC into a smart companion which is always at hand. With it, you can learn foreign languages and travel at ease. Your enhanced device will translate and interpret for you, be sure you’ll understand and be understood. Go global with us! © Copyright 1990-2014 Ectaco, Inc. All rights reserved.